Wow I cant enter because im 17 1/2 not 18? Thats annoying as hell. Is it because of the prize money or something? @Zameroth: It's because you're a minor, and legal things etc. Anyway, those under 18 who wish to enter can email me at [email protected], and I'll hook you up with a document that will allow your parent or other legal guardian to give you permission to participate. I accidentally input my costume length in the symbol for inches instead of feet. Is this going to effect my chances of being accepted? What exactly is supposed to go in the Display Name part? And does the email have to match the email on your account? I just put my usual email, not my account email. >_< Also, how do you know if you made the deadline? @Lix: You'll receive a confirmation email that you are amongst the 100 confirmed contestants. Display name is generally how you wish to be referred to during prizing ceremonies and the like. @Soilfangz: "Weapons" have never been allowed. The selection of items that you've seen from past Costume Contests are still allowed though. Looks like some repeat cosplayers who do the contest every year will likely be screwed, and I already know of some cosplayers who have scrapped designs for some of the big bulkier stuff like certain huge WoW raid bosses. @aNiMeGaMeR: Actually, we had already implemented a stricter version of this rule for the 2011 contest. This version of the rule relaxes the restriction that was implemented during that contest somewhat. The stage in 2011 was designed with safety in mind, and stairways were replaced with ramps. Nonetheless, it's not brightly lit backstage, and we implemented these additional rules to help ensure everyone's safety. We still expect to see a huge variety of exciting costumes this year. 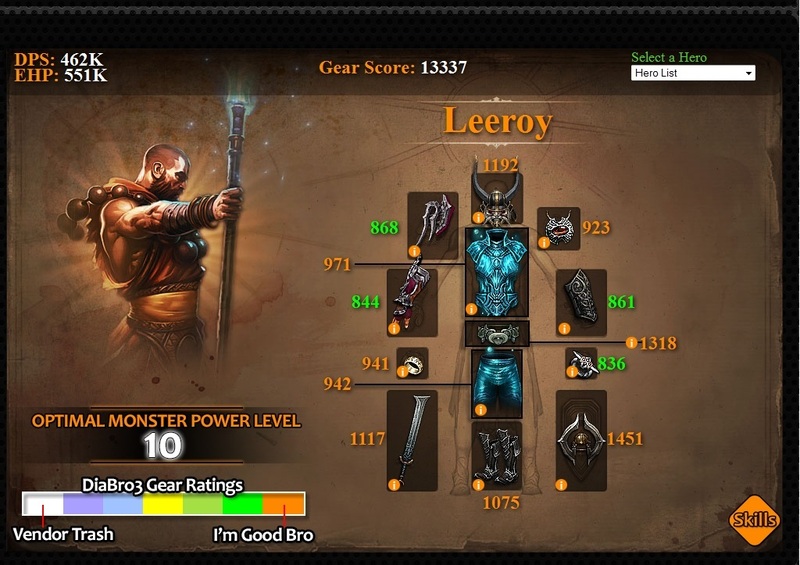 A new Diablo 3 site is emerging with the idea to simplify the evaluation of your characters. The creator of DiaBro3, Fiiresphere, started a topic on our forums, asking what our members thought about it and the site was almost universally praised with its simplicity and accurateness. Even Blizz acknowledged the new site by featuring it on Battle.net! Check out the official post below. At some point, most of us have probably wondered which Monster Power is the best for our characters, at least in terms of farming efficiency. For those players who aren't amazing theorycrafters or number-crunchers, finding the right answer to that question can be a little difficult and, in many cases, requires a lot of trial-and-error (which you may or may not have much time for). 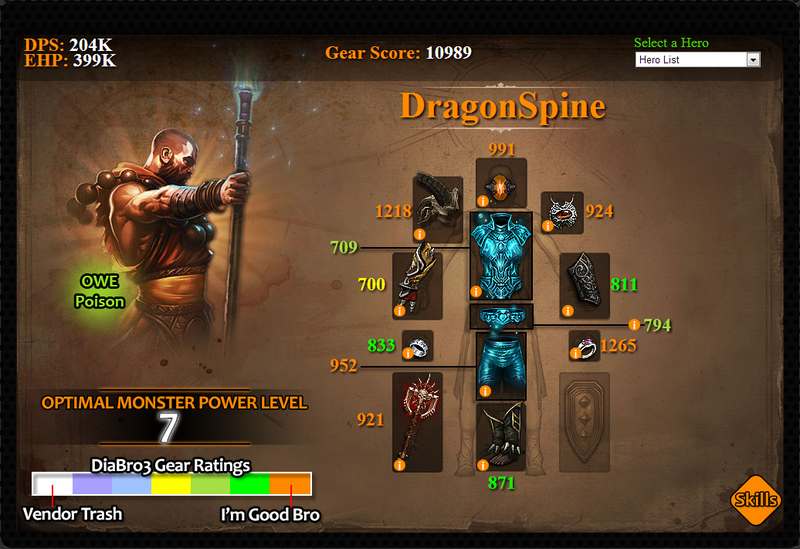 Thankfully, the folks over at DiaBro3.com have put together a quick and easy-to-use calculator to help you determine the general quality of a character's items (as a whole and individual pieces) and, based on those results, suggest an ideal Monster Power level for you to farm on. So, what do you think of DiaBro3.com? Are you satisfied with its gear analysis for your heroes? How did you feel about its suggested Monster Power level for you? Let us know by commenting below! We know a transmogrification feature is in the works, but what should it include? Grimiku offers a few suggestions, but would also like your feedback! In WoW it's called transmogrification, and the ability to visually customize your character adds a layer of depth to the game that a lot of players enjoy. We think it would be cool to implement something like that in Diablo III at some point, but a feature like this has some details to iron out first. We'd like to hear your feedback on some of the options you'd want to see in a feature that enabled you to visually customize your character. Some great examples of questions to get you started are: Would you like to have cosmetic slots on your character sheet? Would you prefer a system where you have a npc make an item look like a different item? Should weapons be included? Should weapons be limited to the same weapon types if they are included? The site is neat, but its saying I should be in mp4 and my clearspeed lets me do 5-6 no problem. I can even survive 9-10 if I felt like spending a long while. Not sure what he uses to judge mp readiness, but it might not be right for all classes. God bless being able to buy 50m for 90 cents eh? Well let's face it, no one can do MP10 without the Gold/RMAH. I did, was not that hard. Get over it. There's no way someone can reach MP10 gear level without using the GAH. Even if you actually did, there is no way to prove that claim. Maybe if you have like 3-4k+ hours played and 150k Elites killed some might believe you. Not me, though.